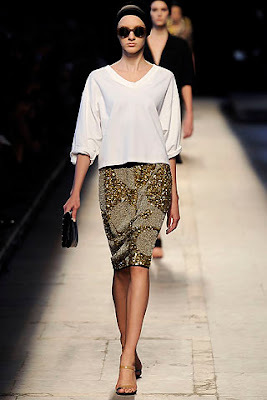 I'm really liking the collection shown this week in Paris by the Belgian designer Dries van Noten (DREEZE van KNOW-ten). 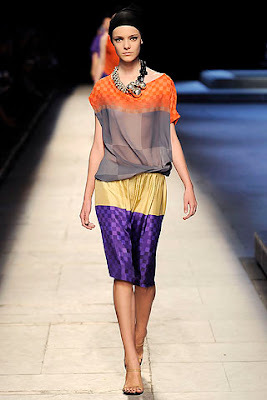 I've written about Dries before here -- I think he's great. These clothes are very new looking and exciting but they are also very wearable. So much that you see in the shows is kind of freaky; Miuccia Prada showed shoes so perilously high that models fell on the runway. These clothes by Dries are modern and simple; it's almost like American sportswear: a tee shirt tucked into a skirt, a button shirt over a long skirt. But at the same time they are very European; you can just picture women in Paris wearing them in the hot summer. 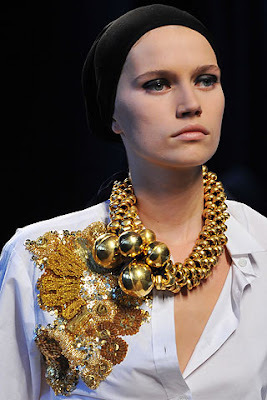 The clothes are clean and chic but new and different at the same time; that is the gift of a great designer. I like the unexpected colors that he combines, as if in a color block painting. This show was held in a tent at the Palais Royal around the Fontaines de Bury. 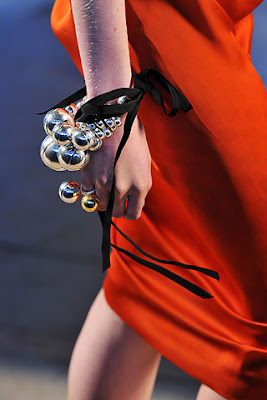 Cathy Horyn at The Times says the silver ball jewelry was inspired by the fountains. Ted and I were in Paris a couple of years ago and visited the Palais Royal, and we are going again...next week! We are going first with some friends and neighbors to visit friends in Amsterdam, and then Ted and I are going on by train to Paris. I'm excited! Dries has a new store on the left bank which I want to visit.